Today’s review is special not only because it covers a Putnam restaurant, but also because this is the first time that I review an entire meal instead of one specific food item. 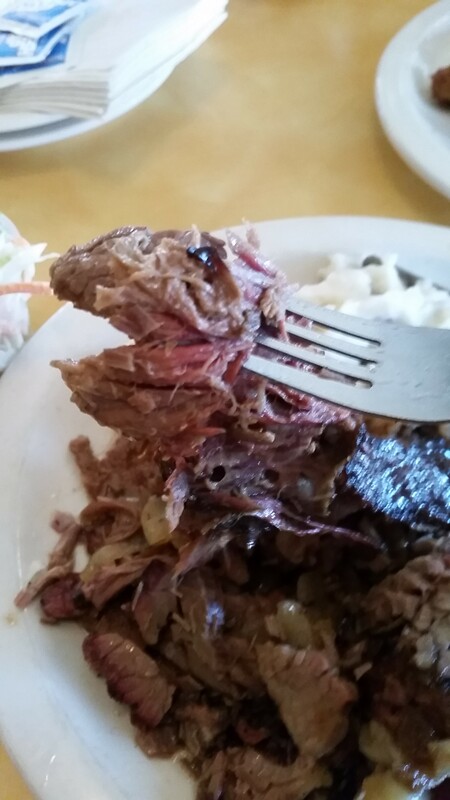 The Texas Brisket Meal from Holy Smoke is our selection, and it is a review that is 11 years in the making. I first noticed Holy Smoke one Sunday in early February 2004 and expressed desire in checking the place out; and now, in 2015, that desire has been fulfilled. 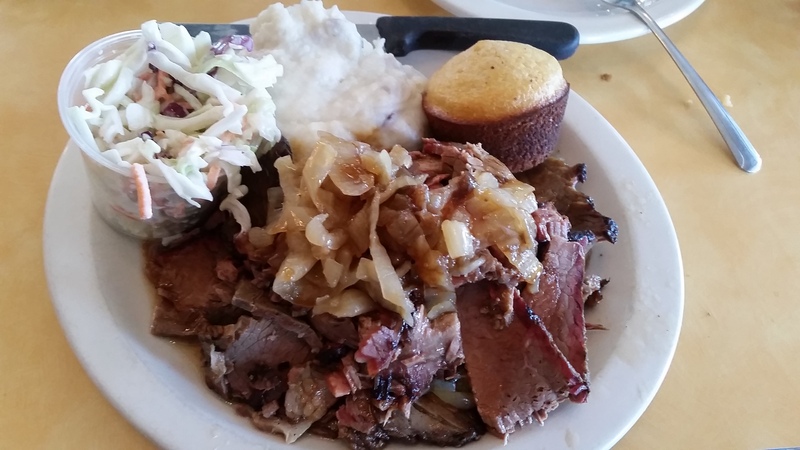 As you can see, this meal from Holy Smoke consists of a few elements; coleslaw, garlic smashed potatoes, cornbread, fried pickles (not pictured above, but included below), and of course, the signature brisket. First, the sides; the coleslaw was thick and provided a nice crunch, the cornbread muffin had the nice combination of a strong crust and a soft inside, and the garlic smashed potatoes were some of the best I’ve had. They were leaner than most mashed potatoes, but included small chunks of whole potatoes in it as well; and the light, but easily detectable taste of garlic throughout really shone through. 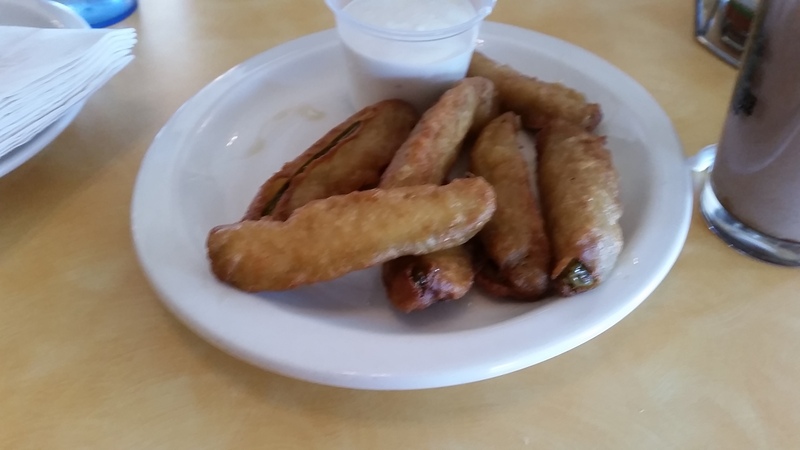 Most venues who serve fried pickles do so in little circular slices, but not Holy Smoke; they give you fried pickle spears, and good ones at that. The breading was light, but had a good taste and texture to them, and the inside was coated nicely, providing a surprising last minute heat (spice) that you do not expect going in. The pickles themselves are thicker than most, and provide a nice bite. Drenched in onions, the linchpin of this meal certainly did not disappoint. After spending 17 hours in the pit, the meat was both tender, and incredibly juicy; there was no point during consumption that I thought the meat was too dry, or unenjoyable. Furthermore, there was so much on the plate that I actually got to take some home and get another lunch out of it. If there is one (minor) criticism to be made, its that there was no standout seasoning or rub that really made the brisket “pop”; but that in no way takes away from the fact that this is a really delectable brisket. 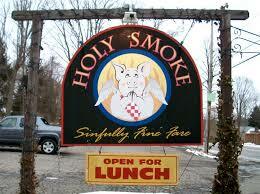 Holy Smoke BBQ in Mahopac NY (located at 241 NY-6N), truly knows how to make a good meal, and I certainly recommend them to anyone looking for good BBQ. Along with the meal, the atmosphere is fun, and has outdoor seating that is ideal during the summer months. I will definitely be going back to Holy Smoke, perhaps even this summer; after all, the Fried Buttermilk Chicken sure sounds good.